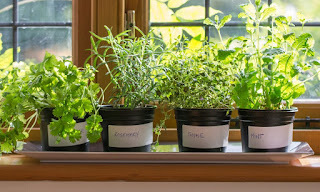 Herbs are the perfect addition to any home garden because they’re easy to grow in a windowsill, and the leaves are useful in a number of ways. These easy herbs to grow indoors are a must-have for every kitchen—whether you want to use them in food or just want to add a faint fragrance to the room. This herb is an essential ingredient in dishes all around the world and pairs well with tomatoes in particular. Having this plant readily accessible grants you the ability to simply pinch off a few leaves whenever you need them. Basil is a great addition to salads and sandwiches, and you could even use it to make homemade pesto sauces. As you go about nurturing this herb, keep in mind that it loves heat and bright light, so keep it in a place that sees regular sunlight. Known for its onion-like flavor, chives are a good addition to any bland dish. The mild kick that this herb provides is great in egg-based dishes, soups, and salads. Chives also act as a beautiful garnish for a plethora of other cuisines. This easy-to-grow herb flourishes best in bright light, and it can continuously regrow if you leave at least two inches at the base after you harvest. Mint is one of the most common ingredients in drinks, salads, and desserts. You could devote a full indoor garden to this lovely herb if you really wanted to—it could feature peppermint, spearmint, chocolate, orange, and banana. This herb is fragrant, too, offering you a bit of a natural air-freshener. While these plants need plenty of sun, they’re pretty durable so long as you keep their soil moist. The earthy fragrance of this herb soothes, warms, and relaxes you as you walk into a room. It also adds a unique punch of flavor to pork, soups, potatoes, and cream sauces. This herb generally tolerates hot, sunny, and dry locations in the summer, but it can still thrive in cooler climates that see temperatures as low as 40 degrees Fahrenheit. Whether you choose between curly or flat-leaf parsley, it’s definitely an herb you’ll want in your kitchen. While chefs often use sprigs of this plant as garnish, parsley also adds a twist of flavor to soups, salads, and homemade sauces. Stuffing, fish, chicken, and vegetable dishes also benefit from this ingredient. Be sure to provide this plant with strong light. To harvest sprigs, pinch the stems off near the base. Before you decide which herbs to grow in your home, do your research—and don’t forget to ask your local garden stores for advice.